A new book about Don’s work looking at his music, words and paintings. Currently only available in Italian. Captain Beefheart, born Don Vliet, is one of the most important and mythologized artists in the entire history of rock music. Starting from a solid blues basis and armed with a powerful voice worthy of Howlin ‘Wolf, in the Sixties he recorded, with his Magic Band, some of the most decisive works for the evolution of blues-rock, releasing in 1969, also thanks to the support of his friend Frank Zappa, the prodigious epic of Trout Mask Replica. The double album, considered by many critics, first of all the legendary Lester Bangs, as the most important ever born in the field of rock music, is a work in which the Delta blues, free jazz, Dadaism, Surrealism, Beat poetry and the American imagination come together in a synthesis that is still incredibly alien today. But Captain Beefheart’s path certainly did not stop at that extraordinary milestone. Even after his withdrawal from the scenes, which took place in 1982 to devote himself full time to painting, he continued to influence entire generations of musicians, who still today venerate his music as an example of creativity without limits, far from the constraints of music business. In addition to recall the whole biographical events of Beefheart’s life and critically analyzing each record of the artist, this book also focuses on his painting, influenced, as well as the dilated spaces of the desert of the Mojave (where he lived for a long time), also by the forms of the Abstract expressionism of Franz Kline, Jackson Pollock and Willem de Kooning. “Captain Mask Replica” is the first systematic study dedicated to the great Californian artist to be made in Italy and it’s released precisely in the fiftieth anniversary of the release of his first album (Safe As Milk, 1967). However we have been in contact with the author Francesco Nunziata who agreed to answer a few questions for us about his love of Beefheart’s music and art and why he has written this book. Radar Station: When did you discover Beefheart’s music? Francesco Nunziata: When I was about eighteen, I read about Trout Mask Replica on a rock encyclopedia. So, I bought it. Right after the first song, “Frownland”, all my rock certainties were disintegrated. Since then, I’ve spent years trying to decipher that double album. In the meantime, I got all Captain Beefheart’s records. With my book, Captain Mask Replica, I hope to have helped to decipher his music. RS: What do you like about his music? RS: Do you have a particular favorite album or song? FN: My favorite album is Trout Mask Replica, an epic journey into the American imagination, riding an unprecedented synthesis of Delta blues, rock, free-jazz, psychedelia, Dadaism, Surrealism, Beat poetry, “jazz canto”, etc. In my opinion, this is the best rock album ever, a tremendously innovative and influential work of art. The music of Trout Mask Replica is shocking because it is shocking the way the music was made! Safe As Milk, Strictly Personal, Mirror Man, Lick My Decals Off, Baby, Bat Chain Puller, Doc At The Radar Station and Ice Cream For Crow are other records of exceptional artistic stature. One of my favorite songs by Captain Beefheart is definitely “Frownland”, the song that, over twenty years ago, put me in touch with a new musical universe. Other tracks that I would carry with me on a desert island are: “Sure ‘Nuff’ Yes, I Do”, “Electricity”, “Abba Zaba”, “Yellow Brick Road”, “Kandy Korn” (in the version released on Mirror Man), “Dachau Blues “,”Bills Corpse “,”Dali’s Car”, “Neon Meate Dream Of A Octafish”, “Hair Pie: Bake 2”, “Steal Softly Thru Snow”, “Doctor Dark”, “Petrified Forest”, “Tropical Hot Dog Night”, “Owed T’Alex”, “Bat Chain Puller”, “The Thousandth and Tenth Day of the Human Totem Pole”, “Ashtray Heart”, “Best Batch Yet”, “Dirty Blue Gene”, “The Past Sure Is Tense” and “Skeleton Makes Good”. RS: What do you think of his artwork? FN: Some of his artworks are particularly effective in revealing the profound synergy between his painting and his music, the two arts through which Don Van Vliet / Captain Beefheart managed to give way to his instinctive, primordial creativity. Covers like that of Shiny Beast, Doc At The Radar Station and Ice Cream For Crow show that his painting was nourished by a particular reinterpretation of Abstract expressionism, revisited in the light of his passion for the boundless spaces of Mojave desert and for the animals and the plants that inhabit it. The most pregnant metaphor of his vision of the artist is, in any case, offered by the cover of Trout Mask Replica, created by the art director Cal Schenkel: the “trout mask”, hiding the identity of the artist, allows the latter to observe the world from a privileged position: the position of his work of art. He is spiritually separated from the world, while still physically continuing to live in it. Behind the “very intricate rainbow trout replica” (as Don sings on “Old Fart At Play”), he will succeed in casting a revealing glimpse into the essence of the world, realizing that every single things is related to the Totality of all beings. RS: Why did you decide to write the book? FN: Except for a small monographic book written by Luca Ferrari in 1996 (Pearls Before Swine, Ice Cream For Crows), in Italy there was no systematic study of Captain Beefheart’s music and painting. So, after initially thinking about an article for the webzine OndaRock (for which I write since 2002), I decided to write a real book, in order to pay homage to the artist who more than anyone else has influenced my vision of rock, but also to give new exposure to one of the few, true geniuses of rock music. 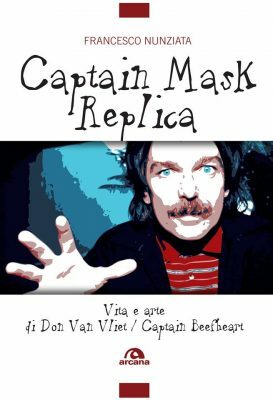 With Captain Mask Replica, I not only narrate the biographical events of the Californian artist, but I also focus my attention on the development of his music, on the importance of his lyrics (as a poet, the way I see it, he is not inferior, to say, to Bob Dylan…) and on the beauty of his painting. Among other things, my book comes out just in the fiftieth anniversary of the publication of Safe As Milk, his debut album released in the legendary 1967. Francesco Nunziata was born in Nocera Inferiore, southern Italy, in 1978, but he has always lived in Palma Campania, near Naples. An Italian teacher, passionate about poetry and philosophy, he began to be interested in music criticism in the late Nineties. Since 2002, he writes on the Onda Rock webzine. “Captain Mask Replica” is his first book.